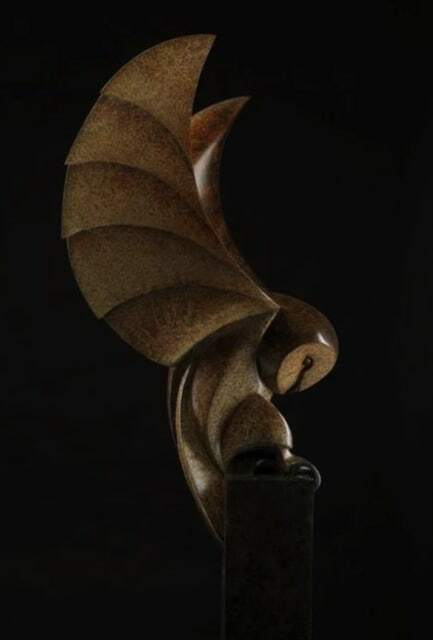 Influenced by nature and art deco design, Paul Harvey's work is primarily in bronze and marble sculpture. He has a global reputation, with his works regularly exhibiting at prestigious shows. With his studio in the centre of the lush Hampshire countryside, he is never short of inspiration for his elegant bird sculptures. Discover our collection of Paul Harvey's sculptures here. Paul Harvey was born in West Sussex during the mid-sixties, and quickly developed an aptitude for art at an early age. Woodcarving became a nascent passion thanks to the encouragement of a primary school art teacher, and he was creating accomplished works from the age of eleven, already developing his interest in sculpting subjects from nature. Birds have been of particular interest to Harvey throughout his life and career, and he had a number of pet birds as a boy, keeping them in aviaries. Consequently, it made sense to him to merge his two passions by carving birds into wood; however, Harvey quickly discovered that the intricacies of designing these creatures in wood did not best suit the form of woodcutting. At first, he decided to simplify the designs into an Art Deco style which would work in woodcut form. However, he later opted to work in bronze sculpture, allowing him far more flexibility with what he creates. Paul's methods of casting bronze sculpture set him apart from many of his peers; as opposed to limited runs, Harvey makes his work to ensure a more reasonable price by using "cold cast resins", which combine bronze powder with copper, iron or marble, creating gorgeous works through a inexpensive and quick-to-set process. His work has sold to collectors and art fans worldwide, and counts the Royal family amongst its fans. He has also had his work on display at several Chelsea Flower Shows. Harvey creates his work in his studio nestled deep in the Hampshire countryside; he has worked with his wife to convert the adjoining pond into a modest nature reserve. This reserve is now home to numerous new subjects for his work-the numerous species of birds which have influenced his life's work.